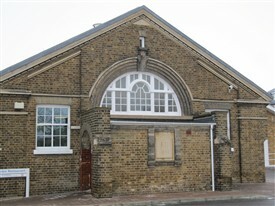 Rochford Union Workhouse was built in 1837 at a cost of £5000. It was intended to house 300 people. Less than fifty years later social conditions were slowly improving and the 1881 Census shows that there were only 172 inmates in addition to the Head of the workhouse, his wife and baby son, four officers and three visitors. Even the 82 year old 'late porter' of the workhouse ended up as an inmate. The census makes very sad reading. There is not much left of the original Rochford workhouse, but what is still to be seen has an interesting past. 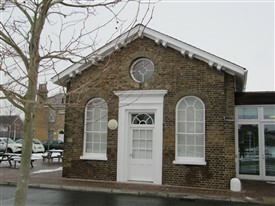 Some of the former workhouse buildings including the chapel, dining room and some other areas are listed as buildings of historical and architectural importance so cannot be altered any further. They were listed when the old Rochford Hospital was threatened with closure in an attempt to prevent the redevelopment of the entire site. A hundred years before the Welfare State was created there were still many people in society who needed help to survive. The elderly, orphans, the disabled, not to mention the unemployed had no state benefits to support them. Sole responsibility for providing essential support fell on the ratepayers of each parish where these people were born or ended up in destitution. In fact, by the first quarter of the 19th century the entire population was growing rapidly. The rural population was increasing at the same time as rural employment was decreasing due to changes in agriculture and industry. More people needing help and less people to provide the rates to pay for it created major social problems. Similar social problems were found all over the country. The new industrial towns were even worse affected than rural areas as often they grew up in places with no parish church around which support could be organised. Often the parish ratepayers, in spite of the definition of 'deserving' or 'undeserving' which was attached to the poor, just could not afford to support increasing numbers of destitute people in their own homes. The solution seemed to be to combine, or unite, the resources of several local parishes and create a Union Workhouse to provide for all the needy in one place. The able bodied were to be put to work and the sick or disabled were cared for in what would be seen now as very rudimentary conditions. Workhouse life was meant to be tough and humiliating as a deterrent to malingerers. Going into the workhouse became the shameful last resort of the desperate. By the time of the 1881 census there were 85 men, 41 women and 46 children housed in the Rochford Union Workhouse. The oldest inmate was a widow of 94 and the youngest a child of one year. There are shown to have been nine 'imbeciles' and one 'deaf and dumb' woman. Contrary to popular belief, families are not shown as particularly numerous but several of the children appear to be orphans. In one family of four the oldest is a girl of 16 and the others are aged eight, six and three. Another family's ages are 16, 14, 10 and five. In yet another, two Hawkwell brothers were without parents at the ages of 11 and five years. Nearly all the inmates were born in the parishes which are now in the Rochford District but some came from the Southend or Benfleet areas and other parts of Essex. In 1881 very few were from further afield. Some adults were put to work in the workhouse buildings as charwomen or maids but 'picking oakum' was the most usual occupation as it was useful to society but extremely hard and unpleasant. Oakum was old, rotten, salty and tarry pieces of broken, worn out hemp rope which had been used, among other things, for the rigging of ships. The oakum was separated by hand into fibres which could then be remade into new ropes. Hundreds of miles of rope were needed each year for all sorts of uses, not just seafaring and this was seen as an excellent use of free labour which, due to the crime of destitution, did not deserve anything better. 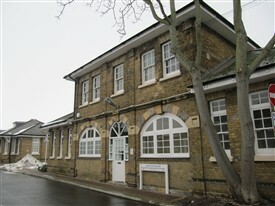 The Rochford Workhouse was extended and altered over the years eventually becoming part of Rochford Hospital. Not so long ago some of the buildings were still used as geriatric wards. This must have been particularly upsetting for elderly people who remembered the humiliation and disgrace attached to those who were classed as workhouse inmates well within their lifetimes. Many people today will hardly notice the narrow road at the bottom of West Street when they cross to the supermarket or station. 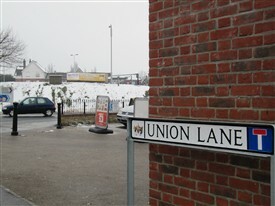 If they do notice, the name Union Lane is a reminder of the harshness of the lives of the poor before the coming of the Welfare State. This page was added by Sue Horncastle on 12/02/2012. In the early 1960's I worked for Southend Boro. Council and paid out several old men their 'wages' as they liked to call them weekly. They lived solely in this huge room (old dining room?) with just a bed and a cupboard all spotless all close together and no belongings. They were paid 12/6d per week just enough for a pint and some baccy and if their shirt fell apart for example they had to put in a request for a visitor to come and check it was necessary. One in particular was delightful. He was the last of the old agricultural labourers whose tied cottages had been taken from them for sale to town dwellers. He was immensely tall and touched his forelock as he spoke to me and always thanked me profusely despite my saying it was his pension I was giving him in his own right but I never got through and he continued profoundly grateful in his thanks until I left. They left quite a memory for me. On my grandmother's birth certificate the address of her mother is Rochford House Rochford, the year is 1917. Would this be the work house? Hello Judith - yes the workhouse was still open in 1935 and it is quite possible that the stillborn twins were the babies of an unmarried mother who may have been thrown out of her home as she was pregnant and had no where to go except the workhouse. Your great-grandfather was probably in the workhouse when he died because before the Welfare State got going after the 2nd World War there was very little other support for people who could not look after themselves due to ill health and infirmity. He may not have been able to pay for medical care in his own home and he was very old so may have used up all his savings by then. Obviously, he would not have been forced to work as able bodied people were. Indeed, the workhouses were the places of last resort for people with all sorts of disabilities as well as the very old and sick. My great-grandfather, Robert McConchie (sometimes Conchie) died in August 1917 in the Union Infirmary, Rochford. The informant of his death was Harry Golby “Master of the Workhouse, Rochford” and I have a copy of the page listing his death, written by Harry Golby. His address when admitted was 28 St Vincent’s Road, Southend. He was 83 and died of “senile decay and cardiac failure”. He had previously had a draper’s shop in Bury St Edmunds. I am curious to know how he came to be in a Workhouse, if that is an accurate description of the place at that time. I would be very grateful if you could advise me what sort of place it was at this time. I'm sorry but I only have the names of people who were at the Rochford Union Workhouse at the time of the 1881 Census. Essex Record Office, Wharf Road, Chelmsford, has further papers and records under the following reference: G/Ro [ROCHFORD UNION]. The Record Office is open to the public at specific times for the purposes of research. If you are unsure of the dates when your father might have been there, you could check the 1921 and 1931 Censuses which are available on line. Hi Sue, just wondering if you have names for people who were in the Workhouse. Particularly interested in the period 1924 to 1928. I believe my Dad was there as a child - from 2 to 5 years of age and I want to confirm this if I can. My late grandmother worked at Connaught House in the 1950's. This large site was called Connaught House in the late 1940s before being renamed Roche Close in the late 1960s. It was an extensive "Old People's Home" as known then, which had a number of wards. It was self-contained with its kitchen, library, laundry, gardens and greenhouses complete with large staff numbers and own matron. It came under the umbrella of the Southend Social Services. My father Wally Jones was the Superintendent at the home followed by Mr Owen. It eventually closed in the late 1970s.